Russia Withdraws Most of Forces From Ukraine Border: U.S.
Browse: Home / Russia Withdraws Most of Forces From Ukraine Border: U.S.
Russia has pulled back most of its troops from the border with Ukraine, according to a U.S. defense official, a move that if completed would fulfill a pledge by Russian President Vladimir Putin. A “majority of the Russian forces” have been withdrawn from the Ukrainian border, Rear Admiral John Kirby, a Pentagon spokesman, told reporters traveling to Singapore with U.S. Defense Secretary Chuck Hagel. About seven battalions of Russian troops, or “several thousands,” remain, he said. Confirmation of the partial withdrawal emerged hours after pro-Russian rebels downed a military helicopter in eastern Ukraine, killing a general and 13 troops. 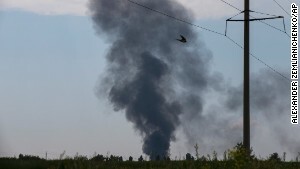 Ukrainian forces used aviation and artillery assets to “destroy” the rebel unit blamed in the attack, the Interior Ministry’s National Guard unit said in a statement. The surge in fighting produced a new round of finger-pointing between the U.S. and Russia. The downing of the helicopter prompted a spokesman for U.S. President Barack Obama to blame “outside” assistance in providing weapons. Russia demanded that Ukraine halt its “fratricidal war” and withdraw troops from the mainly Russian-speaking region of the east after separatists, in other fighting, suffered the heaviest casualties of their campaign. The U.S. and other countries should use their influence to stop Ukraine from “sliding into a national catastrophe,” the Foreign Ministry in Moscow said on its website. The fighting had renewed questions about Russia’s pledge to pull back its troops from Ukraine’s borders. The Russian RBC news service reported that the troop withdrawal had been halted, and that a significant amount of equipment remains near the border. The service cited an unidentified person in the army’s General Staff. Dmitry Peskov, Putin’s spokesman, declined to comment when reached by phone late yesterday. Earlier yesterday, the press service of Ukraine’s border guards said Russia had reduced the number of soldiers stationed on its border with Ukraine to about 20,000 from about 50,000. The Russian troops were leaving behind military assets, suggesting they may return, the service said, without being more specific. Insurgents used a shoulder-fired missile to shoot down an Mi-8 transport chopper amid heavy fighting in Slovyansk, 100 miles (160 kilometers) from the Russian border, Speaker Oleksandr Turchynov told Ukraine’s parliament yesterday. “We are concerned that this indicates separatists continue to have access to advanced weaponry and other assistance from the outside,” White House spokesman Jay Carney told reporters in Washington. U.S. Secretary of State John Kerry, in a phone call with Russian Foreign Minister Sergei Lavrov, raised concerns about foreign fighters crossing the border from Russia, particularly reports of the involvement of Chechens, according to the State Department. Kerry pressed Lavrov to “end all support for separatists, denounce their actions, and call on them to lay down their arms,” department spokeswoman Jen Psaki said. Ukrainian President-elect Petro Poroshenko has vowed to wipe out the insurgents and re-establish order after winning office on May 25 with 54.7 percent of the vote. He’s faced with trying to stabilize an economy that the European Bank for Reconstruction and Development expects will shrink 7 percent this year while reclaiming swaths of territory captured by pro-Russian militias. Obama plans to meet with Poroshenko during a trip to Europe next week, the U.S. leader told NPR News in an interview. Obama told the radio network he expects to discuss Russia’s seizure of Crimea with Poroshenko during their meeting.